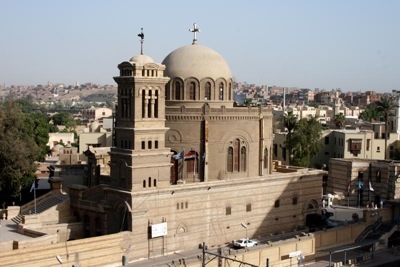 The Church of Saint George in Old Cairo is said to be built over the prison where St. George the Great Martyr is said to have been imprisoned and tortured for a period of approximately 2.5 months. 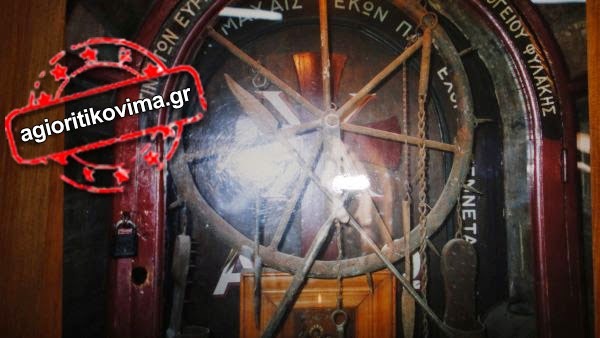 Many of these instruments still exist in the nearby monastery today. The Monastery of St. George (Deir Al-Banat) in Old (Coptic) Cairo, Egypt is a monastery of the Greek Orthodox Church of Alexandria. 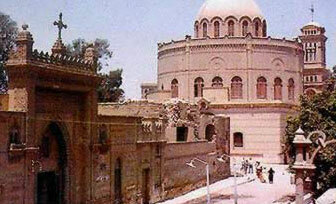 It is adjacent to the Church of St. George (Mar Girgis), the seat of the Greek Patriarch of Alexandria. Both are built over an old Roman fortress. Confusingly, just down the road is another Church of St. George and a Convent of St. George, both of which are under the Copts. The origin of the Monastery of Saint George (Deir Al-Banat) is obscure, but it is believed that the foundation of the structure dates from the seventh or eighth century. Today, the monastery is actually home to between thirty and forty nuns. The nuns offer for the veneration of the faithful an iron collar and chain. 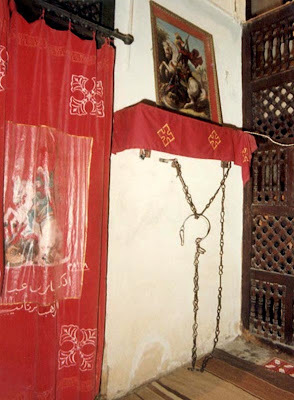 This wonder-working chain, some 4.2 meters long, is attached to the south wall of the inner room of the shrine. Normally the chain is applied to women, though men sometimes seek the blessings of the saint through the chain. Whomever places the halter of the chain around his neck and winds the chain around his body, kissing the chain piously and offering prayers to Saint George, is considered to receive grace. 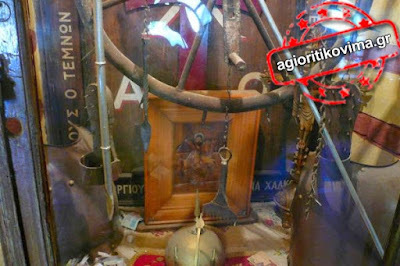 The chains of Saint George are believed to posses miraculous powers to cure the demon-possessed and paralytics. The New Testament narrative of the Gadarene demoniac "who had often been bound with fetters and chains" (Mark 5:3-4) demonstrates that chains were used to restrain the mentally ill and possessed. A parallel story in the Coptic tradition tells of Theophilus II (953–956), the sixtieth Coptic patriarch of Alexandria, who was so overcome by anger that he took off his vestments and the schema (a four-meter long plaited leather girdle worn by monks), and an unclean spirit descended upon him and struck him down, so that he was bound with iron chains for the rest of his life. Since the seventeenth century, the chains of Saint George in the Greek Orthodox Convent of Saint George have been used to tie up those suffering from, besides demonic possession, also nervous disorders, anxiety neuroses, conversion hysteria, obsessional neuroses and even schizophrenic psychoses. Today, large numbers of Greeks, Copts and even Muslims, who have great faith in St. George, visit the Shrine of the Chains of Saint George in the Convent on Fridays and Sundays. At the convent, Greeks from Greece, Lebanon, Cyprus and Egypt used to assemble for the feast of Saint George on the night of April 22 to behold the apparition of the celestial rider on his white horse above the dome of the old church. Apparently the nuns of the old convent have continued the age-old tradition. Nearby the monastery is the Church of St. George. The Greek Church of St. George is one of the few round churches still in existence in the East, formed from it's placement atop a rounded Roman tower. The Holy Family is said to have taken shelter in a place now covered by the Church. There is a long set of steps that lead up to the church that are built on the outer wall of the Roman towers. As one ascends these steps, there can be found a relief of St. George and the dragon wrapped around the outer brickwork of the tower. The church had been burned many times. It burned in 1904 and the current structure was built in 1909, but still has some of the older structure's beautiful stained-glass windows. For centuries, the church alternated between ownership by the Copts and the Greeks, but since the 15th century it has remained Greek Orthodox. Sadly, the original Church of St. George that burned was considered one of the most beautiful and richest in the Roman fortress of Babylon. Traditionally, the earliest church was built in 684 by Athanasius, who was a wealthy scribe. During the Papacy of Pope Gabriel (88th Patriarch) the relics of the saint were relocated to his well-known church in Old Cairo. However, the newer church is culturally interesting, for amidst a fury of burning candles, scenes from St. George's valiant fight for Christianity are depicted through the art of many different styles, periods and medias. Below are two video of the Church of St. George, the first of which goes down into the prison area.